So be it, we were in development mode, so this was tossed into the pile of things we were developing. 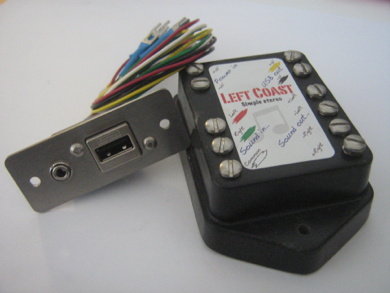 What we came up with is the Left Coast Simple Stereo. The idea is that you install the plug in plate somewhere that you can get to it. Then, mount the Simple Stereo module “behind the scenes”. Attach 12V & speakers, done! Think of it like an iHome. But its an iHome that’s designed to be installed in a boat/car/RV. To run it needs 12 Volts and a pair of speakers. 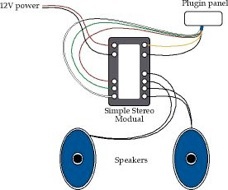 The Simple Stereo uses 4 Ohm, 50 to 100 watt speakers. The same thing factory car stereos typically use. The main module is, but the plugin plate is not. If you get seawater in the plugs, they’re not going to like that much. Idle power is about 60 milliamps. As you turn up the volume, it will use up to about 3/4 amp or so.